Ask fellow campers about "Interstate RV Park" and nearby attractions. Not too bad of a campground, sites were level gravel, grass was cut but had many weeds, roads were adequate as to ease of movement for our 35ft coach and toad. Site was gravel, and very close to your neighbor, so facilities were very close to coach, had exactly 2 inches between water connection which was way too high and our slide. CG had a pool and a small store but was reasonably close to all stores, Walmart, Meijers and the rest. Thought price was a bit above normal for type of site. We camped at Interstate RV Park in a Motorhome. Location is "just" outside main area, but stores are reasonably close, did not see much in the ay of entertainment nearby. Overall a campground that has a lot of full timers that live there. Well maintained with flowers and such however for big rig they need to trim or cut the trees back. Had a hard time getting out of my site because of tree. Sites are unlevel . Did not use Bathrooms or Showers. You share water connections with your neighbor. No cable and Limited Wi-Fi. We camped at Interstate RV Park in a Motorhome. Easy on-off from I80. Pull through sites. Some highway noise but not bothersome. A good place to stop for an overnight. We would stay here again if in the area. Wifi was Tengointernet which we did not use. Satellite worked well. Verizon good. We camped at Interstate RV Park in a Motorhome. We stayed here for 2 nights in our motorhome. It is a very nicely maintained park, BUT I would say that maybe 1/3 of the spots are being used by seasonal, longer term renters (and there are obviously a few that are there year-round), so some sections of the park have the trailer park feel. The staff we encountered were all friendly. Buildings were well maintained. Swimming pool and shower area was spotless. They were busy mowing grass and doing outside maintenance both days of our stay. The park is very convenient to I-80. Noise was not a problem. Our pull-through was very close to neighbors. The site was not that level, but jacks got us there. Some sites have tree cover, so satellite TV reception may be an issue if you have a roof-top dish. Our site had a small patio and a picnic table. We would stay there again. It's a good overnight location and, if you have kids or enjoy the pool yourself after a long summer day, it's a good spot. We camped at Interstate RV Park in a Motorhome. Farm and Fleet store across the street to east. Three major truck stops at interstate interchange. Northpark mall about 15 minute drive (all the major stores and many restaurants). 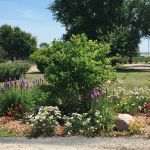 The campground is easy access from I-80 with gravel roads throughout and sites that are either gravel or grass. The CG is nicely maintained with flowers and trees throughout. 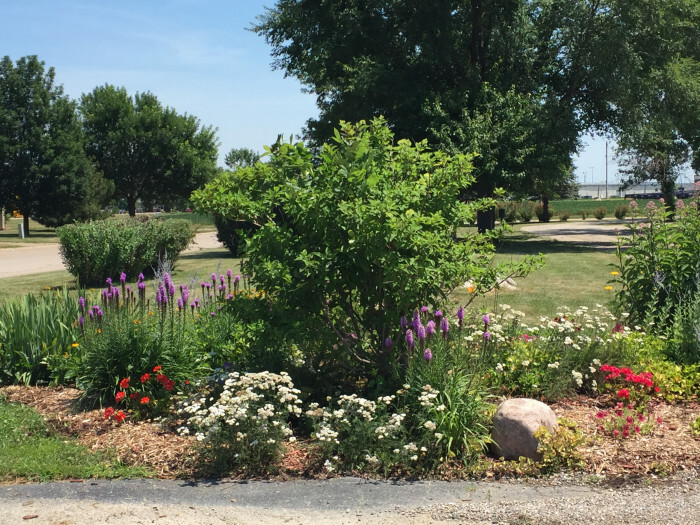 Although it is close to the highway, there is quite a bit of open land around the campground which is very pretty and helped to make it quiet. We drive a 45 foot MH with a tow and were able to navigate into, through, and out of the park with the car attached, although we did brush the trees throughout the CG. The sites are gravel with grass between and close together. Sewer is to the rear of the site with water and electric to the middle. Utilities worked fine and water pressure was good. We were in the pull-through sites at the entrance to the CG and our site was satellite friendly and also very good OTA reception. There is no cable in the CG. We did not use the Wi-Fi, rest rooms, or laundry so cannot comment on that. Verizon reception adequate for gentle internet use. There is no designated dog park and we saw folks walking their dogs through the campground and along the perimeter. It was hot when we were there and many patrons were enjoying the pool, which looked clean and refreshing. The office receptionist was extremely friendly. We would use this campground again if we were in the area. 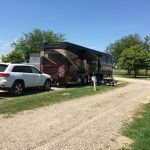 We camped at Interstate RV Park in a Motorhome. There is a Flying J at the same exit as the campground. We selected this park for a month because they advertised 50A electric hookups and reliable wi-fi. However, only 20% of their sites have 50A available, and those are all occupied by long-term residents. The rest are 30A only. In addition, the park's two Wi-Fi networks have only one antenna each, and both are at or beside the office. Neither reaches our site, which is near the other end of the RV Park. Our picnic table (and many others at other sites) are weather-beaten and appear unsafe. They're so bad that long-term residents have moved the park's picnic tables aside and purchased their own. If you plan to stay here and you need 50A electricity and/or useable Wi-Fi, I recommend getting a commitment IN WRITING, IN ADVANCE, that you will have both, and a WRITTEN guarantee of a full refund of all deposits or other monies paid if the park cannot deliver all promised amenities. We camped at Interstate RV Park in a Motorhome. 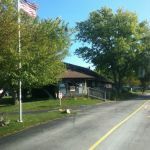 Nice campground and convenient for an overnight stay just off I-80. Owners were wonderful. With the windows open there was some minor noise from the highway but it was not really a big issue. We'd stay there again. We camped at Interstate RV Park in a Motorhome. We arrived 15 minutes before closing. The site #9 was a pull-thru with full hook-ups. The sites are a little tight for our rig The site had a picnic table on a concrete slip which was busted up as heavy RV's have driven over them. The lady in the office was very nice. We would stay again if ever in the area. We camped at Interstate RV Park in a Motorhome. Just checked in on a 93 degree day in late Sept. Park is relatively clean and the sites are fairly level. Campground is convenient to I-80 but the entry could use better signage. Many of the cement patios are useable but in need of repair. On this 93 degree day I was looking forward to a brief swim. The disgusting filth in the pool would scare a turtle away. Oddly, the gate to the pool was open for use. I saw sign requiring a HAZMAT suit but I wouldn't go in if I had one. We camped at Interstate RV Park in a Motorhome. Very close to HWH Leveling if you need to have work done there. HWH has several electric only sites available to customers in their yard. Very convenient to I-80. Roads and sites are hard pack dirt. Getting out from our site, #59, was a bit tight. Sites are level and long. Each has a concrete patio, but ours and several others we noticed were in terrible shape. A lawsuit waiting to happen. Picnic table. The utilities worked good and most sites looked to be satellite friendly. The restrooms were nice. Staff was very friendly and courteous. We camped at Interstate RV Park in a Motorhome. Price seemed reasonable for a park with every amenity and where everything worked. Sites were adequately long and wide and utility placement was fine. The gravel roads were not a problem. Wifi worked well except in the evenings, typical. Good satellite TV reception in site #12. The pool was lovely. We would stay here again. We camped at Interstate RV Park in a Motorhome. The Shed Restaurant is right across I-80. Think the original Cracker Barrel. We stopped in on a Saturday night and the line was out the door. My only real problem with this park is the price. It's certainly a decent place to stay, but the price is out of line for the area (I'm talking about the daily rate for 50 amp FHU). They have a limited number of 50 amp sites, so this year they have a rule that you can't stay in a 50 amp site longer than 5 days. They do keep it fairly full, I suppose due to convenient access to I-80. There are also a lot of long-term units in the 30 amp sections, and they are well-kept. The gravel parking drives are kind of narrow and very close to the power pedestals and hydrants. Watch your slides. We camped at Interstate RV Park in a Motorhome. We stayed here one night and I agree with previous comment. Convenient to I-80 and Flying J. Staff was very nice. The new Wifi worked great. It took a bit to understand how to connect to it but once I did that it worked very well and certainly better than many parks we have visited on this trip. Park was quiet and clean. Sites were a little tight but acceptable. We would stay here again. We camped at Interstate RV Park in a Motorhome. Park is ok for an overnight stop. It's convenient to I-80 and Flying J / Loves Fuel Stops. Sites are gravel and slightly narrow. Sites are level and long enough but utility placement is strange. Our water hookup was on the door side of the rig. Park just got new WiFi installation and WiFi is terrible. The signal is so weak it's very hard to get a connection even though less than 100' from the tower. The old service was better. 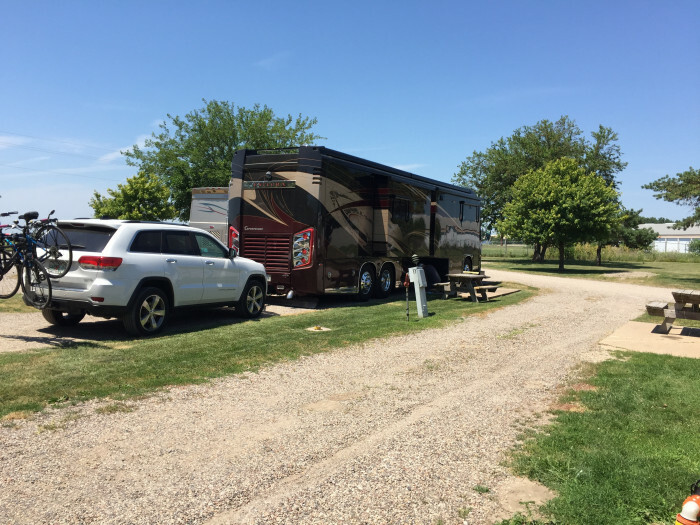 We camped at Interstate RV Park in a Fifth Wheel. The Shed restaurant is just on the other side of the Interstate. Very nice home style food. Great overnight stop. Paid $42.00 with Good Sam discount, did not research other options in area for price & location, spur of moment decision. Close to interstate and truck stops for fuel. Roads could use work but not that bad, seen much worse. We arrived after hours without a reservation, helped our self to site 3, up front by office. Appears this section has all the transients; all units left next morning but one. Full hookups, all working. Site was somewhat narrow but adequate for our overnight. Park looks appealing and appears to have majority of fulltime/seasonal residents. Did not use or checkout any of the showers or Wi-Fi. Good Verizon connection. Our spot did have a tree that blocked satellite reception. Met staff in the morning, every one very friendly. We would consider staying here again if in area. We camped at Interstate RV Park in a Motorhome. A must-do when camping here is dinner at the Machine Shed Restaurant about a mile down the road. Best Iowa pork on the planet. We were in the Quad Cities for a repair on our rig. Lots of things to do here but this location was just too noisy. We would return to this area but not this park. Flying J, Speedco and Blue Beacon are convenient at this exit. Are you affiliated with Interstate RV Park ?